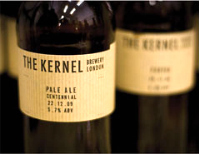 By all accounts, the small Bermondsey-based Kernel Brewery makes the kinds of beers that, as the frothy liquid washes over your palate, have the effect of making you pause for a moment, perhaps causing your head to drop back an inch as you feel compelled to wonder what exactly it is you've just sent southwards. It's beer, Jim - but not as we know it. And I mean that in a good way. It's wonderful to see another independent brewery doing well in the capital – this one, run by a gentleman by the name of Evin O'Riordain, has been operating for more than a year now, and every Saturday the place throws its doors open to the drinking public. The idea for the brewery was simple, but will not be scoffed at by lovers of the hop-based beverage – the idea being: "the need to have more good beer". Among the beers the place brews is the mind-blowing 7.8 percent Export Stout, based on a London brewery's recipe dating back to 1890. Kernel Brewery's website describes this one thus: "simple recipe, massive taste". And a fair amount of alcohol too. I imagine this one will want to be supped slowly, and appreciated - like a fine wine. The brewery's India Pale Ale also packs a punch at 7.1 percent, but it's more Barry McGuigan than the Mike Tyson mauling you might get from one too many of the Export Stout (Mike Tyson in his heyday, that is). Described intriguingly as "American hops meet English malt", this one supposedly gives the sensation of "a fruit salad on the palate....followed up with some pepper and spice". Moving down the list, you'll find their Chinhook Pale Ale (5.1 percent). Ideal for fans of beer with a crisp, clean and fresh taste. The Centennial Pale Ale (5.2 percent) sports a pale golden colour and has an aroma of grapefruit and elderflowers, with "a rounded, juicy texture". Another strong one is the Baltic Porter, coming in at 7.3 percent. Considered to be "on the drier and fruitier side of the spectrum", this one has, among many things, "a hint of coffee and a touch of wood and woodland herbs". Finally, there's a good ol' London Porter (5.4 percent). Now this looks like a beer everybody will want to have a taste of. Sounding more like a picnic hamper than a beverage, this one will remind you of "chocolate, raisin, coffee and a touch of roasted, smoky malt [with] fruits at the fore developing into some sour berry tones and succeeded by dark chocolate & coffee dominating the finish." Don't you simply love the way they describe these drinks? I'm drooling just at the thought of trying one (or all) of them. 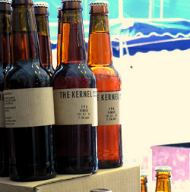 The Kernel Brewery is situated under the railway arches alongside other small retailers (many selling fresh food) just a short walk from Tower Bridge, so you could easily spend a couple of hours browsing in the brewery's shop before taking a look around to see what else the area offers. Why? 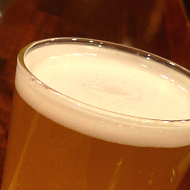 You'll be supporting local business and tasting some decent beer at the same time. When: Saturdays from 9am to 3pm.